A journey into complete jazz guitar mastery in two volumes. Volume two now released! Intermediates. Learn single note soloing in volume 1 and chord melody in volume 2. Intermediate level. A complete beginner's guide to the guitar. Learn music fundamentals, chords, pentatonic scales and much more. Subscribe To The Inside Track and download free Chris Standring jazz guitar transcriptions, play along tracks and band parts. Fill out the form below and get a download link delivered straight to your inbox! 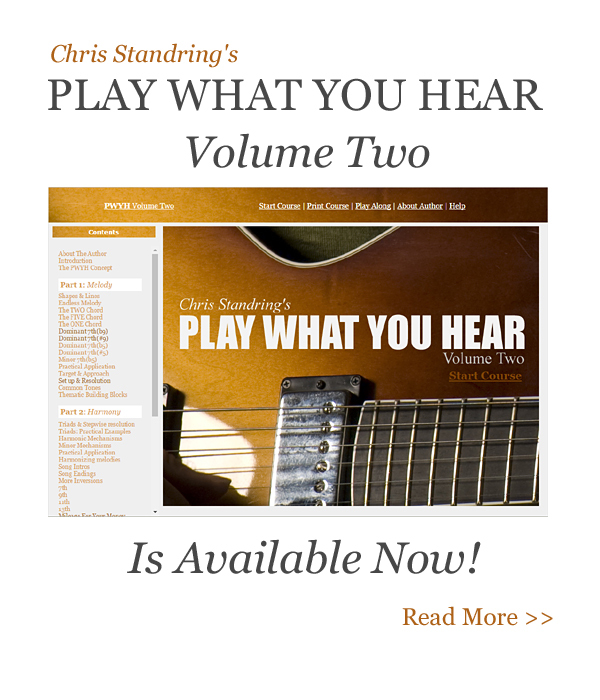 Every week for eight weeks receive a new Chris Standring album track along with complete solo jazz guitar transcription, play along track, rhythm section parts and score, all printed in high def pdf! I give Play Jazz Guitar and Chris Standring Music Inc. permission to send me email about new special offers. Hi I'm Chris Standring and I run PlayJazzGuitar.com - the website you have just landed at. I've been ensconced in the jazz guitar world for about 30 years now. I've made many records and it's time to give back a little. I'm very interested in creating new effective ways to teach the jazz guitar language and since the success of my first Play What You Hear jazz instructional program I am intrigued to be able to capitalize on that interactive idea to present new programs in the future. Do subscribe to my newsletter as I have many cool items of jazz guitar news for you, including a ton of free lessons. Click on the subscribe tab at the top. I have a section that features jazz guitar articles I have personally penned. I have many thoughts about the artistry of jazz guitar, particularly as I am often going through various issues myself and I like to get my thoughts down on paper. Check out the all new jazz guitar solo transcriptions section. This will grow to be a great resource for all players wanting to expand their melodic vocabulary. I also have a growing library of free jazz guitar lessons targetted at the beginner, intermediate and advanced student. If you are looking for systematic step by step jazz guitar lessons to really improve your playing, I invite you to check out my programs. My Play What You Hear course has stood the test of time where thousands of students have become fantastic players. And now volume two is released and I can't tell you how proud of this I am. I also have two Jazz Guitar Video Masterclass programs. Jazz Guitar Video Masterclass volume one focuses on single note soloing and playing through chord chnages, whereas Jazz Guitar Video Masterclass Volume two focuses 100% on chord melody in the style of Joe Pass. Finally, if you are looking for the ultimate practice resource then look no further than The Inside Track, a private member's site - a one stop for all your jazz guitar study needs, and a whole lot more. The membership includes access to all my guitar instructional programs. Check out the Inside Track here. Thanks for dropping by, don't be a stranger, and do drop me a line, I'm always happy to get feedback and answer any questions..